How to Change the Start Page of the Windows Phone 8 Application in Visual Studio 2012? 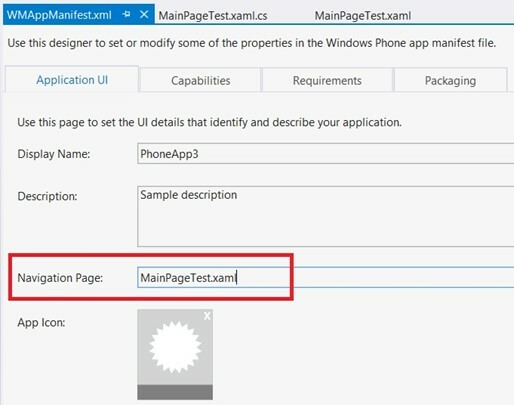 When developing a Windows Phone 8 App, you might want to rename the default MainPage.xaml file or wish to change the Start Page of the Windows Phone Application from MainPage.xaml. In my previous blog posts, I explained the use of the Manifest designer isn’t it? One can use it for Changing the Start Page of the Windows Phone 8 Application in Visual Studio 2012. 1. Double click and open the WMAppManifest.xml in the Manifest designer. 2. In the Application UI tab/page, edit the textbox “Navigation Page” to the new Start Page of your Application and Save the Project. The Start Page of the Windows Phone 8 Application is now modified. Nice post. Pretty helpful for a beginner like me. I followed post and set my first start page to develop windows phone application development, thanks for sharing. Nice to hear that the article helped you .